For the past year or so, Suss Müsik has participated in the weekly Disquiet Junto projects led by Marc Weidenbaum. For those unfamiliar, a junto is a gathering of like-minded colleagues for the purpose of sharing knowledge, friendship and conversation. The first Junto, known as the Leather Apron Club (now there’s a great name for a band), was launched by Benjamin Franklin in 1727 and lasted for 30 years. Taking part in the Disquiet Junto has turned out to be a richly rewarding experience. We’ve made new friends and been exposed to a constellation of artistic influences from around the globe. Sadly, we were also made aware of the plight of Bassel Khartabil, a 3D modeling artist and software developer who was was detained by the Syrian government in 2012. Since his incarceration, human rights organizations have persistently campaigned for Khartabil’s release. His last known whereabouts was the Adra Prison in the suburbs of Damascus, Syria in October 2015. It was unknown whether Khartabil was alive or dead up until very recently, when in August 2017 his widow received confirmation that her husband had been executed. In celebration of Khartabil’s life and work, English/Swedish musician and Junto participant Rupert Lally spearheaded the creation and release of a 31-track compilation album entitled A Future to Commons. All of the music is provided by participants of the Disquiet Junto. Suss Müsik is honored to be a part of this moving tribute, yet we are frustrated at the senseless nature by which evil is permitted to transgress the boundaries of human existence. One might concede that from suffering can arise newly semantic forms of artistic expression, although we’d argue that a world with Bassel Khartabil alive and safe is better than one without. During [Bassel Khartabil’s] incarceration, and during the extended period when his death was presumed but not yet confirmed, his story became a rallying point around the world. His plight inspired essays, and conference sessions, and political statements. And it inspired music … Facets of Bassel’s life provided several such prompts over the years. We created soundscapes to bring a new dimension to his CGI renderings. We sampled his voice and turned it into music. We created VR scores, and we tried to extrapolate sound from the poetic language of his correspondence. In the end, what we tried to do was spread word of his plight, to keep his story alive even after he was no longer. 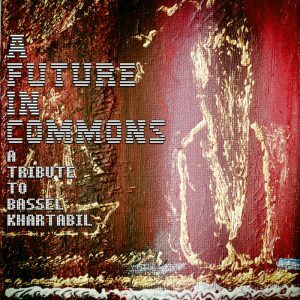 A Future to Commons is available on Bandcamp, with all proceeds going toward the Creative Commons Bassel Khartabil Memorial Fund.